In a recent piece Nathan E. Richards writes, â€œMany young black academics â€¦ have expressed concern about the ability of ‘politically black’ academics to adequately represent and eludicate the experience of ‘ethnically black’ womenâ€. Richards informs us that he is no fan of the term ‘polictically black’ and urges caution in how we use it. Without providing an explanation, Richards tells us that it is â€œhighly contentiousâ€ to conflate the ‘ethnically black’ under an umbrella term like ‘politically black’. And the reader is just supposed to know why this is so. I will argue that if this is indeed the case then it is due to the loss of historical memory more so than the fact the term might be entering its death throes, as Richards claims. Obviously, I see there are concerns expressed here about an enforced homogeneity under the rubric of Blackness or in Richard’s lexicon ‘political blackness’. While on closer reading I discover that what is being alluded to in Richards piece is a belief that there are some members of academia who use political blackness to further their own careers at the expense of ‘ethnically black’ post-graduates. More simply put: there are ‘brown’ academics positioned as ‘politically black’ who are hoovering up opportunities within the academy thus preventing the entry of qualified ‘ethnically black’ candidates into these same positions. So I’m surprised to discover that Richards is resurrecting an old argument once voiced by Tariq Modood , once a senior research fellow at the Policy Studies Institute and who has since been awarded an MBE for services to social sciences and ethnic relations in 2001. Only Richards has turned Modood’s argument on its head. Positioning himself as a spokesman for the Asian community while the manichean controversy over The Satanic Verses raged in the late eighties, Modood claimed Black identity could no longer serve the interests of Asian communities because it was rooted in the Pan-Africanist and Black Power movement of the 1960s and 1970s which, for him, implied Asian subordination to an Afro-Caribbean political leadership. He believed ‘political blackness’ was harmful to Asians because it falsely equated racial discrimination with colour discrimination and encouraged a disregard for the particular discriminations Asians suffered which he said was based on their cultural and religious practices. Modood opposed the idea that in the British context blackness could denote an hybridity of identities and experiences capable of resisting notions of phenotypic specificity. Blackness as an identity in the UK has always been wielded quite differently from the way it is in the US. At least here, in the face of the virulent racism of the Thatcher years, Black identity never embraced a single homogeneous identity and was able to contain within it a multiplicity of difference. But Modood saw in blackness a hierarchy which he believed favoured those who were ‘more black’ by virtue of being able to claim a direct African connection. Recognition of a radical political identity among working class immigrants was occurring while the Powellites in the Conservative party asserted that ‘Britishness’ had remained essentially unchanged as white and superior by the presence of ‘alien’ immigrant communities – a disorderly and dangerous other â€“ who were incapable of assimilation. This idea continues to echo today. Ask yourself why it is, for instance, that Polish migration is not seen as a threat to British culture? It is because Poles, unlike the Roma, are not marked visibly by blackness and are able to disappear into the mainstream of British society. For Modood the idea that such militancy could successfully pressurise the state into greater recognition of African, Caribbean or Asian identity or that it could ever be the cornerstone of a left-wing movement was something he wished to decentre by playing off race against culture. Even as communities of Afro-Caribbeans and Asians had similar histories of oppression having been enticed here as cheap exploitable labour and even as they experienced disadvantages in terms of housing, education and employment. It was these commonalities that the ideological identification as Black had been based on. During the 1970s and 1980s Black Power had fired Asian militancy among the youth and women workers who took industrial action against employers in defence of their rights. In one particularly bitter strike action, Grunwick women workers had struck in anger after a fellow worker had miscarried due to the long hours and conditions on the factory floor. Management clamped down on the time workers were allowed for lunch and toilet breaks, hours were long. This was in a climate when workers who had to see doctors and arrived at work late were told to go home and return to work the next day, thus losing an entire days pay. The strike action had less to do with cultural practices specific to Asian women. It was about anger at the their mistreatment as women; as human beings. This resistance was happening even as it was becoming increasingly difficult to strike due to anti-union legislation introduced by the Tory government. So much legislation had been introduced to outlaw strikes that so often Asian women found themselves confronting their employers without the backing of their unions and thus having to draw on the support of the wider Asian and Afro-Caribbean community. 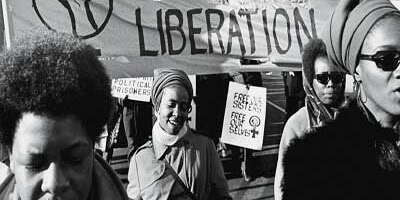 At this time there had been an upsurge in women’s groups that defined their constituencies as comprising members from the Caribbean, African and Asian communities such as the Brixton Black Women’s Group, Southall Black Sisters and the Brixton Defence Campaign. Collective militant values were under constant attack as Britain’s manufacturing base – the practical point of existence for the working class and the source of its political identity and solidarity – was exported abroad. Consequently, working class solidarity had begun to diseintegrate by the time of Modood’s criticism of the black/white paradigm. In an attempt to reorganise consent as jobs disappeared and the welfare state was subject to cut backs, the state heaped further injury on the ‘white’ working class condemning it as lazy, feckless, racist, sexist and homophobic. In my view, Modood’s interjection was particularly useful to the state at this time because it helped to reorganise the ‘common sense’ around race and identity by restructuring and re-dividing a once militant Black working class that now had to stand on its own against unsupportive union leaders who said we had to learn the ways of this culture. And further, it is difficult not to infer from Modood’s comments a certain touch of the native informant and his embrace of the anti-black racism prevalent within Britain. Unlike African culture which was and is still seen as primitive in comparison to British ‘civilization’ which structured ‘primitive’ identities as targets for super-exploitation, Asian cultures were deemed to possess a level of development and cultural cohesion not generally attributed to Africans. The end goal of Modood’s argument – that solidarity among Asian communities rested on their cultural identity as Muslims and not â€œpolitical blacknessâ€ – was wielded as a weapon to disparage the leadership of those whose blackness has historically carried overtones of inferiority. ‘Black’ as an appellation for non-whites was coined at a time when labels like coloureds, blacks, nig nogs, browns, darkies, Pakis were in common circulation. Radicals asked themselves what was the absolute worst … the most negative thing they could be called in Britain? Black – because of its symbolic association with evil, dirt and the devil incarnate in opposition to white purity – was chosen. One can also see a deep-seated aversion to ‘Black’ as a political identity coming from more recent ranks of non-white immigrants who are not aware of this history and regard its usage as literally tarring all non-whites with these negative overtones. For instance that Chinese woman who tells you that she bristles at the idea of having to check the black box on the census form because she also unconsciously ascribes to these notions of purity and evil. However, remember it came into usage as a political ideology rooted in challenging British racism and anti-blackness. As Sivanandan says, â€œblack is a political colour, not the colour of your skin… the colour of oppression today is blackâ€. Social identities such as race, ethnicity, gender and disability work through physical markers that predict which occupations you will go into, what your outcomes in life will be. They do not displace class but work alongside and through it, intersectionally. Academics have failed to explain the relationship between class, race and gender against their critics on the left who argue identity politics poses a problem for forming alliances and is a threat to any political agenda that seeks majority support. Too often identity has been used opportunistically to exaggerate differences or enscribe a forced homogeniety but just because it has been used in this way does not mean that identity-based movements will always devolve into these adversarial tendencies. And when they do, it is often because dominant groups are unable to understand how an identity-based political movement advances the interests of the entire class as part of their own struggle for a better society. To return to the hints and allusions in Richards’ piece: the place for Richards to start is with the fact that – within the UK – Asian, Black and ethnic minority academics are under-represented in our universities. The research is out there. No one group is getting more of the pie than others. Insinuating that â€œbrownâ€ academics might consciously massage this under-representation for their own benefit by appropriating â€œpolitical blacknessâ€ is to fall victim to a competitive and fragmented identity politics. And how are we to determine who is â€œethnically blackâ€? Ethnically black implies an essentialised identity which leads us into the horror of binary thinking. An Us and Them. The kind of thinking that not so long ago pitted Hutus against Tutsis or today encourages Brits to look impassively on the apocalypse visited by Britain on the Middle East. While once Modood might have set culture against race, Richards crudely pits the â€œethnically blackâ€ against â€œbrownsâ€. How is this essentialising of race different from the Aryan race espoused by Nazis? There is absolutely no reason why I can’t accuse Richards and those who espouse similar ideas of fostering anti-Muslim, anti-Asian or anti-Arab racism; a move which also puts us in danger of undoing the gains made by antiracists and Black feminists in the past. A more inclusive articulation of political consciousness under the rubric of Black identity has always proven to be an effective way to mobilise against imperialism and racism. Oppression can not be fought in a piecemeal way. One can not authentically struggle against, for instance, racism, while remaining complicit with other forms of oppression. We must instead struggle with the full matrix of oppression. Together. And if I don’t fight for you, who will fight for me?